Yo WarriorMagic, based on the list you sent me it seems like you want to go with the value route. Is there a particular budget that you have in mind? 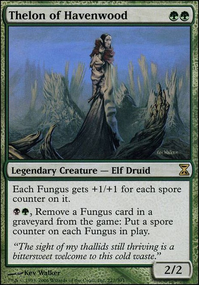 Muldrotha has access to a plethora of colors, I can help you get like a defined list of core cards and packages that would be great and than you can add in your particular flair that you like to make it more personalized for your meta or style. Right away from what I can see these are already a list of cards you can cut due to inefficiency. fearfactor19 on Dem Cheap Zombies Doe! Legendary_Shadow subbed in the last Death Baron and swapped out the Signets for Golgari Lockets. I see what you mean about the Cabal Stronghold I hope I can grab some Overgrown Tombs. It is based off undergrowth :). Its cards I currently have but I do have multiples of most of them. I have played it multiple times and it's only lost twice both times due to bad pulls. (Once too much mana, and once not enough.) Admittedly though that win record doesn't mean a lot because the people that I'm playing against are mostly beginners like me. Llanowar Elves and Golgari Locket help with the mana issue as well as Glowspore Shaman and Grow from the Ashes. Budget isn't really an issue within reason. To kickstart my collection I've probably collectively spent around $500. (my fiance and I started playing together so we buy a lot then split the cards.) Mostly what I want to find out is are there cards in the deck that I don't really need or aren't doing any good. I seem to have a bad habit of shoving cards into decks just because I like the card or I'm excited about it i.e. Phylactery Lich. Also I'd like to know if there are cards that I should put more of in this deck or cards that I should add that would strengthen it. I have a limited pool of people to play against so I can't really get a thorough testing. I'm also going to add this post to the description somewhat in order to increase the intuitiveness of my request. Thanks for the help! I agree with most of this, but here's some possible cards. 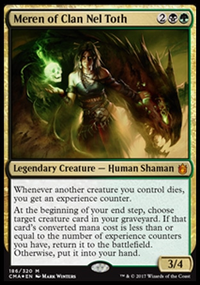 Momir Vig, Simic Visionary is a good tutor card and is definitely budget at below $5. 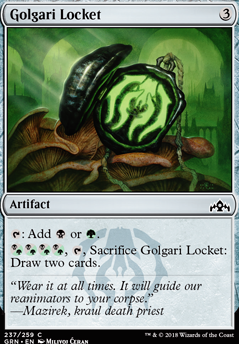 You could try replacing the signets with Golgari Locket, Dimir Locket, and/or Selesnya Locket. 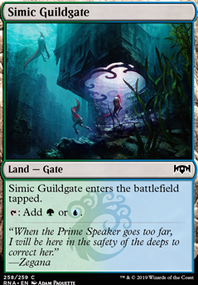 In addition, you could try using the Simic Cluestone. The signets are more like mana converters, so if you want to improve your ramp, try those. 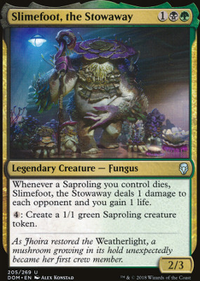 You could also look at Simic Growth Chamber. Elvish Piper for those higher cost creatures.